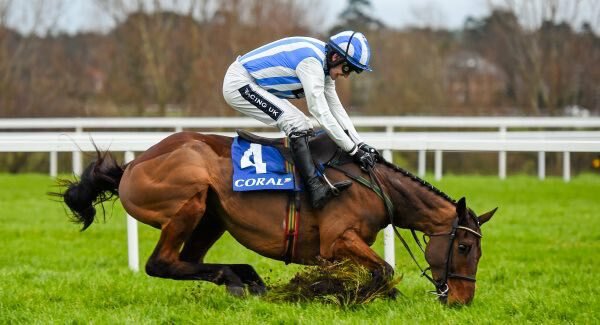 It's Monday morning and that means we are taking our weekly look back at the world of jump racing and there is plenty to talk about once again with some top class sport to pick over from both sides of the Irish Sea. We are of course taking s look back on the last seven days with at least half an eye on the Cheltenham Festival which is now a matter of weeks away. It wasn't one of the stellar weekends of jump racing but there was still plenty of Graded action to keep us busy on both sides of the Irish Sea and a number of them are worth scribbling down in the old Festival notebook. There was a cracking card at Warwick on Saturday afternoon as they hosted their Classic Chase card and there were a number of nice displays to consider. Willie Mullins is clearly tired of dominating the sport over in Ireland as he decided to send over a number of his nice horses to Warwick and as you would expect, he cleaned up. Black Hercules was having his second start over fences and he duly won the Betfred Mobile Hampton Novices Chase over 3m in decent fashion. The Graham Wylie owned chaser jumped and travelled with style before pulling clear of the decent Definitly Red in testing ground and he has to be one to consider for the RSA Chase in March. The one worry for Black Hercules fans would be his 7th place in the Albert Bartlett in 2015 but he has done everything right so far over fences and as such William Hill cut him from 20/1, into 12/1 for the RSA Chase as a result of this latest win. The other Willie Mullins winner on the Warwick card came in the form of Thomas Hobson who won the Grade 2 Leamington Novices Hurdle. The Rich Ricci trained horse set a very strong gallop in the early stages and at one stage looked as though he was going to pay for it but he found more energy from somewhere to claim a quite taking win in the end. Thomas Hobson is clearly not at the top of the pile when it comes to the Mullins Novice Hurdlers but he jumped and stayed well this day and his current price of 20/1 for the Albert Bartlett with Sky Bet might make some appeal at this stage. Willie Mullins also claimed the two big Graded races at Naas on Saturday with Sempre Medici and Roi Des Frances both taking the eye, despite perhaps not being the very best horses in his yard. Sempre Medici won the Limestone Lad Hurdle over 2m3f with the minimum of fuss and although he is unlikely to be a Cheltenham winner he could turn up in a Champion Hurdle (50/1) with an outside chance of running on into a place although something like the Aintree Hurdle may suit him better. The win from Roi Des Francs was perhaps the one to take from the Naas card though as he beat his more well fancied stable-mate Pont Alexandre over 3m in the Woodlands Park 100 Club Novice Chase. A terrific jumper who seems to love a trip, Roi Fes Francs is 20/1 (from 33s) with Paddy Power for the RSA Chase whilst the same firm go as short as 5/1 (from 10s) about Roi Des Francs winning the four miler in March. Perhaps the most stunning moment of the week came at Leopardstown on Sunday and yep you guessed it, it involved another Willie Mullins winner. Killultagh Vic looked to have the race sewn up as he came to the last in the Coral.ie Novice Chase over 2m3f but after jumping the last ok the horse appeared to stumble. Killultagh Vic threw Ruby Walsh up in the air and ground to a halt to allow both Blair Perrone and Lord Scoundrel to race past and take the lead. Somehow, Ruby Walsh managed to stay on the horse before getting Killultagh Vic going again and quite remarkably the horse managed to get back up from a standing start to claim a famous victory. It was a remarkable performance from Killultagh Vic who looks all class despite that mistake at the last and as a former Cheltenham Festival winner, his price of 4/1 (from 6/1) with Ladbrokes for the JLT Novices Hurdle could well only get shorter in the coming days. This is not a Willie Mullins appreciation column (not really anyway) so it might be best to mention another trainer or two this week. One of those is Nicky Henderson who would have been very pleased with the second start over fences for L'Ami Serge who won the Live Betting at 188bet Novices Chase at Wetherby on Saturday in fine fashion. A very classy hurdler, L'Ami Serge has taken to fences well so far despite the limited opposition and we did at least see that he has some extra stamina in the tank as he stepped up to 2m3f for the first time. His Arkle price was shaved a point into 7/1 (from 8s) with Bet365, but the JLT is now a real possibility to avoid Douvan and his price for that race is now a best price 12/1 (from 14s) with Ladbrokes. One horse who very much took the eye last Friday was Sceau Royal who won the Juvenile Hurdle at Huntingdon for Alan King. It was a third win on the bounce for this very likeable juvenile and although he didn't beat too much on Friday, there was a lot to like about this display with his jumping in particular very eye catching. The Triumph Hurdle betting is pretty wide open apart from Ivanovich Gorbatov but Sceau Royal is an excellent jumper with a good engine and his current price of 16/1 with Hills looks rather decent at this stage to say the least. We must also mention the performance of Don Cossack who returned at Thurles last Thursday as he had what could be a final start before he goes for the Gold Cup in March. The highest rated chaser in training last season, Don Cossack fell in the King George last month and duly bounced back here with a workmanlike win over an inadequate trip. Bryan Cooper was forced to niggle Don Cossack along on a number of occasions before he finally got the better of come average horses to win the Kinloch Brae Chase and all roads now lead to Cheltenham for him. There is no doubt Don Cossack will be better on decent ground and back up in trip whilst cheek-pieces are also being considered for him after he appeared to race lazy once again. The bookmakers were not overly impressed with this run with Betfred pushing him out to 5/1 (from 9/2) for the Gold Cup after this run but punters ruling him out based on this performance should do so at their peril. Willie Mullins picks up a double at Warwick with Thomas Hobson and Black Hercules winning in testing ground. L'Ami Serge wins over 2m3f at Wetherby and could now be aimed at the JLT Novices Chase in March.